With this iExpression you can rotate a layer such that it oscilates like a pendulum. The point around which the pendulum rotates is the anchor point of the layer. On 2D layers the iExpression can be applied to the rotation, on 3D layers it can be applied to the x rotation, y rotation or z rotation. determines, in which angle (in degrees) the pendulum starts. is the speed with which the pendulum starts oscillating. determines how fast the movement decays. 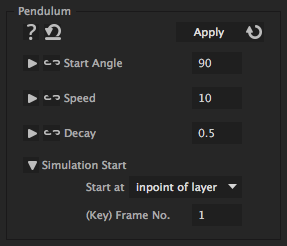 is the frame or the keyframe (depending on the choice of "Start at" option) at which the pendulum simulation starts. When "Start at" has the value 'inpoint of layer' this option is ignored.